When I was young, my parents loved to travel, and they always included my sister and me. That was the beginning of my love of adventure! I studied French and Spanish all through high school, and in my junior year, A.F.S., the American Field Service, brought four exchange students to our high school program from France, Argentina, Sweden, and Finland. They stayed in local students’ family homes, and I became friends with the girl from Sweden. She taught me some songs and some Swedish words. Thee experience ignited my interest in traveling to other countries. That early interest in travel and languages led me to take an opportunity to live and study in Europe. I lived there for a year—best year ever! I loved meeting people in other countries and learning at least a few words of their languages. I’m older now, and the love of travelling around our own United States and re-visiting locations, friends, and acquaintances both here and abroad still hold its charm for me. Have confidence in yourself. Most people are friendly and happy to meet you. Reach out and give them a chance. But also travel smart. Protect your belongings—and leave the expensive jewelry at home. Get started on those plans. Pick a destination you’ve always wanted to visit. Then go online to search for flights and learn all you can about that location. Browse hotel and restaurant reviews, read up on what to see in the places you’re planning to visit, and some history about your chosen destination, because it will add depth to your experience. And if you’re a foodie, check out the restaurants. Preparing can be part of the fun of travel, too! Talk with friends who have visited the places you want to see. Ask them to tell you about their experiences and let them give you advice on what to see and what to avoid. Keep in mind that everyone’s experiences are different, and you will probably hear varying responses to the same questions. Ask more than one person, and go online to check out all the information you can find. You can go “old school” and check out your local library, or purchase reference books that are full of information and advice. If you are familiar with social media, and have friends and connections, ask them too. Also, there are many “expat” websites for people who have decided to live abroad. You can learn a lot from the people who live where you would like to visit. Decide if you wish to travel alone, with a friend, or perhaps a group to handle all the details for you. If traveling with a friend, make sure that friend has the same level of interest and desire for activity that you do. An active person who loves hiking or exploring won’t be happy travelling with someone who’d rather sit in a café for the afternoon. Be daring. Be courageous. The best times are when you meet the people who live where you are visiting. Most of them are gracious and willing to share in your adventure. If you’re travelling to a foreign country and know any words of their language—use them! Or learn a few if you can. You will be appreciated for your efforts. Travel will broaden your view of this wonderful world we live in. I know you will very likely want to share your experiences in a blog or in social media with friends. You may even be inspired to write a story about your adventures! Wherever you go, you will make new friends and create a storehouse of happy memories. 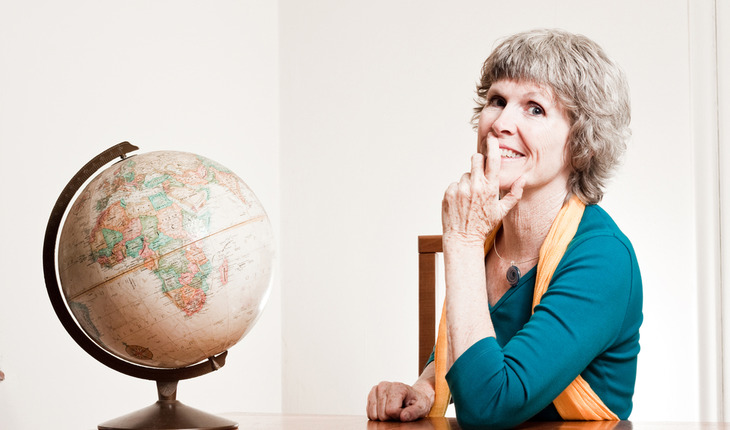 Travel and living abroad, coupled with Joan K. Lacy’s interests in archaeology, science, myths and legends, inspired her to write the novel A Shadow Away, the first book in the “Alex Cort Adventures” series. She hopes you will enjoy the flavor of travel with A Shadow Away even if you’re only an armchair adventurer! For more information visit www.joanklacy.com.